As much as I want to believe the powerful statement in the picture...it's hard. But I currently want to see what it would be like being a lawyer and I also want to see what it would be like being an investment banker. However I don't want to pursue these careers, get heavily involved, realize I hate it, and be stuck and full of regret. To be honest, I have never really regreted anything I have done - even the slackin off in Japanese and my crackin under the pressure Freshman year of Dook - but I don't want my hard work for a potential career to be my first one. I bet you are thinking...well, why doesn't she go for her dream career? Dream careers = no regrets. Anyone out there stressin about future plans? 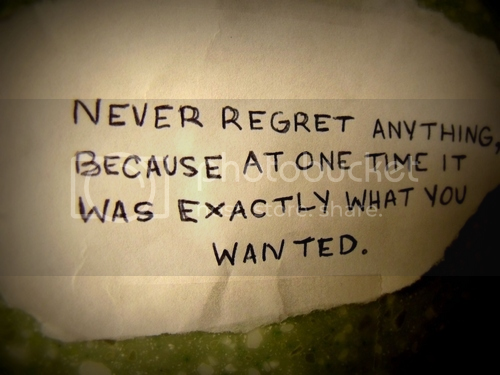 Frettin over regrets? Does anyone work in i-banking or lawyer-ing that can give me some advice so I can stop freeeeeeakin out? Leave a comment and let me knowwww dearies! Okee dokee - gonna go to my neuroscience homework now!